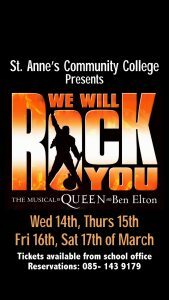 Tickets are flying out the door for the eagerly awaited production of “We Will Rock You” taking place in St. Anne’s Community College from Wednesday 14th March to Saturday 17th March inclusive. The performance on Friday night has now been fully sold out but there are still tickets available at the school office for the performances on the other nights but book soon to avoid disappointed. By killaloeteacher in Other on March 12, 2018 .